All of our courses have been tested, applied, and studied by thousands of students worldwide! We offer an effective approach to learning the martial arts and have done so for many years with success. Why pay hundreds or even thousands in contract fees and expenses when you can simply learn at your own time whenever you want too. Learn at your own pace. Our systems are simple to learn and easy to apply. Many students worldwide have benefited from our styles and so can you! Learn today! Train at your own pace, learn in your own home today! All of our courses are endorsed by professionals i.e. Police, Swat, Military, Govt. Agencies, and fellow Martial Artists Worldwide (see endorsements). Please feel free to email us with your questions. We have over 25+ years of experience in the martial arts with students all over the World! 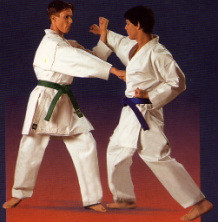 We are among the oldest online martial art Academy offering home study courses. Many online schools have come and gone over the years while we remain. Our students are dedicated, motivated, and benefit from our courses. Feel free to read some of the endorsements. If using Money Orders, Cashier's Checks, or Personal Checks for PAYMENT METHODS PLEASE Email us using the order codes listed below the price when submitting orders by email or snail mail. I will then email you the total and you may mail off payment. Please email us first though. Worldwide . Domestic is First class, International is Airmail. **For the certificate courses, the certificates come standard business card size as the norm. Rank Certificates for our martial art styles will be sent via email ,A hard copy on 8 1/2 x 11 standard size sheet can be mailed with a special order. and paste to your site. Disclaimer / Buyer waiver The SKKA Academy is not liable nor responsible in any way should a death, accident, or injury result to either the student, friends, partners, or strangers as a result from any of the materials including CD's / DVD's, products and any and all written and electronic text from the SKKA Academy, its website, and auctions. You must be at least 18 years of age. Consult a doctor for any medical condition before practicing. Our certificates issued by this Academy are certified only from the SKKA Academy and the VKA Association. Buyer assumes all risks. Furthermore, under NO circumstances is any of this material, products, and programs offered on this website are to be critized by any other persons in any negative way either print, posted on any website, or verbally spoken that would harm the SKKA Academy. Any persons who break this policy are commiting a libel or slanderous offense. Buyer agrees to all the statements, rules, policies, and hereby agrees to this disclaimer / waiver policy in FULL when making any purchase to any material on this website. It is the responsibility of the student to look up the local codes and laws of their community. No persons are allowed to buy, purchase, or acquire any of this material, courses, or texts and anything for sale website or any of our auctions on ebay for anything other than to learn the material. The SKKA reserves the right to refuse to sell any courses to any persons at any time. These courses are not for everyone and we do not have fancy editing, no fancy music. All of Our certificates are only recognized by the SKKA Academy and VKA. You may receive a newsletter from us from time to time.